On Wednesday 5 March 1930 a meeting took place of those "interested in matters of Art, and with the object of forming a society for the exhibition of works of Art". The meeting followed a letter which had been circulated to those people thought most likely to be interested in such adventure. 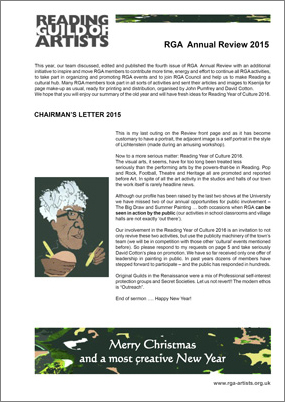 The joint signatories of the letter were Professor Allen Seaby, Professor of Fine Art at the University of Reading, and William Smallcombe, Curator of Reading Museum and Art Gallery. Seventeen people attended the meeting and the occasion marked the beginning of the Reading Guild of Artists. Officers were elected with Professor Seaby appointed as President. The Guild brought together the "Town and Gown" with professional and amateur artists. 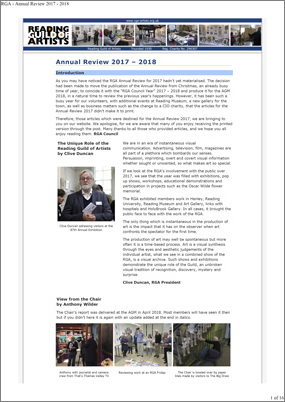 Near ninty years later, with a membership of over 170 artists, the Guild still thrives and plays an active role in the development of artists in Reading. Allen Seaby (1867-1953) was a remarkable man achieving many things in his life. 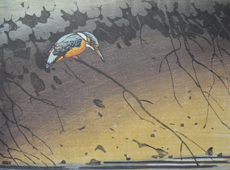 A notable artist and printmaker, he became one of the country's leading wildlife artists pioneering woodblock printing of Japanese style, he was also an educationalist and author. Seaby continued as a loyal member of the RGA and exhibited with the Guild until his death in 1953. 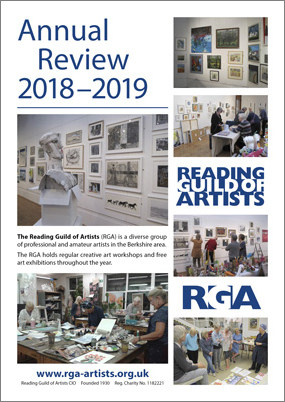 Today, the RGA organises an Annual Exhibition in the spring, a Summer Show, and The Royal Berkshire Hospital Corridor Exhibition, as well as additional smaller exhibitions. 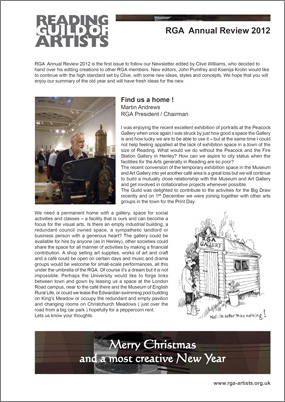 Venues include The Old Fire Station, Henley-on-Thames, The University of Reading, The Reading Museum, The Peacock Gallery, Reading Contemporary Art Fair. Many members also participate in The White Knight Studio Trail, Caversham Arts Trail and The Reading Art Fair on an individual basis. Membership is open to all, and new members are very welcome, from the experienced professionals to complete beginners and those with an interest in the visual arts. Group at an exhibition in the early 1960s. Left to right: E M Skrimshire, Jack Earl, Daphne Probyn, Marie Dyson, Eve Chantler and, behind her Jack Orford. Photo of William Smallcombe kindly donated by his grandson Mike and family.